M. Night Shyamalan has created a comic book world completely divorced from real-world comic books, yet all he wants to do in Glass is fit into the canon of superhero comics. The exposition often harps on, among many other things, comics—their origins, their narrative formulae, their character construction. Glass is a superhero film, in that it recenters Shyamalan’s Split into a superhero versus arch-villain plotline, in which James McAvoy’s multiple personality super villain “The Horde” is recruited by fellow inmate at the Raven Hill Memorial psychiatric hospital, Elijah “Mister Glass” Price (Samuel L. Jackson) to face off against the super-strong David Dunn (Bruce Willis), aka “The Overseer.” It is one of the more punctuated lines of dialogue in the trailer. “Sounds like the bad guys teaming up,” Jackson says with a sly grin. It is a wink-and-nod line. In a trailer, it piques the interest. 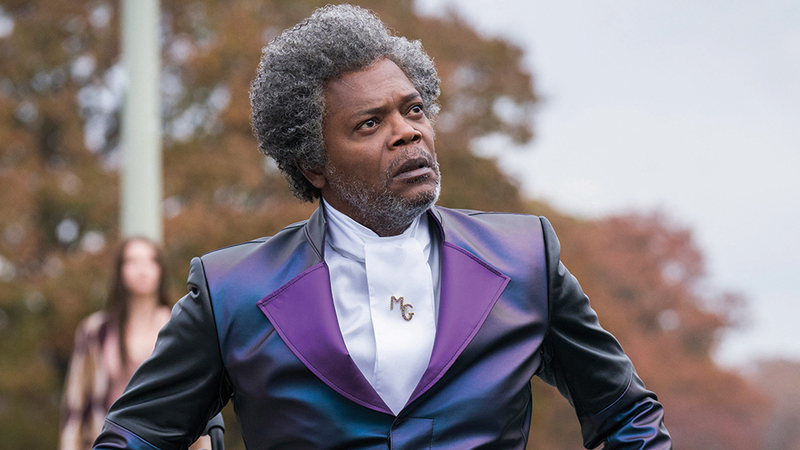 It makes Glass appear as Shyamalan’s deconstruction of the omnipresent superhero genre. And this is certainly his intent, but the execution comes off more like a self-parody. Before the movie reaches its natural starting point, which is about 20 minutes in, we see evidence of this self-parody in a cameo by the director himself. It is a reflexive choice without import to the narrative. It is awkwardly staged and overly explained. And it exemplifies quite well what is wrong about Glass. Shyamalan has never been the most adept at screenwriting. He is clearly a visually-focused director, emulating his idols like Hitchcock. That emulation exists in Glass, with plenty of mobile POV shots and static images that focus on the staging of foreground and background. But his script does not trust his directorial hand. He betrays his visual voice with the voices of his characters, who constantly pipe in unnecessary exposition. What results are characters that don’t sound realistic, who are serving the plot rather than themselves. More importantly, though, is that this poor writing hobbles what Shyamalan does well in Glass. Shyamalan’s visual language is more than adequate to tell this story, but he feels the need to explain himself with dialogue. This flattens the more dynamic scenes. It makes the story-telling frustrating. It makes a farce out of the climax and resolution. The general premise of Glass is fantastic. You have, in the height of superhero cinema, a film that creates a sequel to a movie from the early days of superhero cinema in which the superhero formula is deconstructed without it being a parody. This idea is brilliant. The execution of this idea, however, is flawed. There are plenty of sequences with intrigue. The scene highlighted most prominently in the trailer, with the three poster figures sitting in a row being psychoanalyzed by Sarah Paulson’s psychiatrist character, is one of the more entertaining in the film. The color, the static subjective framing, the acting. All of these elements top out in this scene. And throughout the film the color palettes and subjective framing choices are dynamic and interesting. The acting from McAvoy and Jackson are compelling from moment one. While sometimes silly in terms of how it is scripted, McAvoy’s ability to make snap transitions between distinct character voices is commendable. Glass is a passion project for Shyamalan, and he has interesting ideas on his mind. But it almost feels as if he was too worried about the film failing to trust the audience to follow the visual language and use their base knowledge of the ubiquitous superhero genre to understand his ideas. This translates to a film that is too hand-holding, too overt in its genre deconstruction, too blunt in its story-telling. And this takes away from what could be enjoyable about the premise.